But you also see many couples choosing a kilt wedding, who have no obvious connection to either Scotland or Ireland. One thing is sure, these couples are looking for a way to make their wedding day as memorable as possible. And there is no better way to do that, than to have the groom and his groomsmen resplendent in full Highland Dress. Below you can see a photo which illustrates this beautifully. Often the choice of tartan for the kilts will reflect the clan connection, that either the groom or indeed sometimes the bride's family have, with a particular Scottish or Irish clan. This can be seen in the next photo, it shows the bride being walked down the aisle by her father, also in full Highland Dress, and the kilt is in his clan tartan. 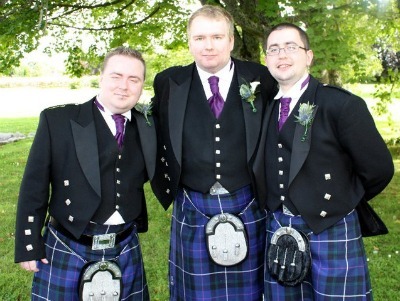 It is not unusual to see the groom and all his groomsmen dressed in identical kilts, as in the first photo above. Although I must say that I personally prefer to see a wide variety of different tartans being worn, not only by the groom and groomsmen, but also by many of the male guests. 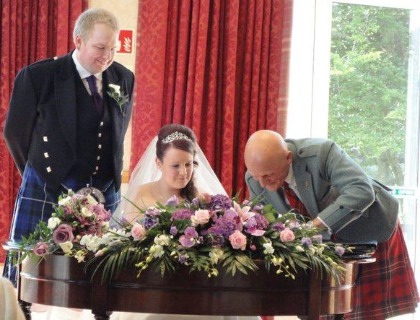 At this particular wedding which took place in a hotel, it was not only the wedding party and guests who wore wedding kilts, but also the Registrar. You can see how smart he looks in the following photo, as he stoops to sign the register of marriage. And don't forget the kilts for children attending the wedding, there is nothing cuter than one or two page boys in Highland dress. But you can't get married in a kilt without all the accessories that go with it, and there are quite a few to be taken into consideration. That is why buying your entire kilt outfit, can add a considerable amount to the wedding budget. And its for this reason that some couples decide the cost is just to high, so what's the alternative? Well for those who don't own or wish to buy their kilts, the alternative is wedding kilt rentals, which provides you with a complete Highland Dress outfit at a fraction of the cost of buying. Although you should be aware that the choice of tartans when renting kilts, is often fairly limited. Have you been married in a kilt? Have you, like me, been married in a kilt? If so, I, and other readers of this website would like you to share your wedding kilt story, and some photos. Was your bride happy or surprised when you first told her of your plans to wear Highland Dress, or did you surprise her on the day, by turning up in a kilt? 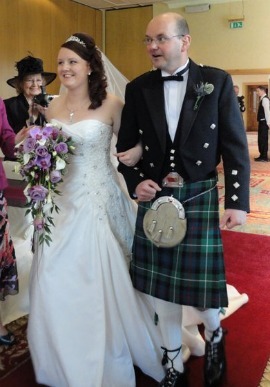 Whatever your wedding kilt story, you can share it here with your fellow visitors! Many people myself included, are not satisfied with just having lots of kilts on display at their wedding, they also choose to have a wedding piper to add to the sense of occasion. So if you want a wedding day that really stands out in people's memories, having lots of kilts will make your wedding something special, and it makes for wonderful wedding photos too. If you would like any further advice on kilts for your wedding, please drop me a line using the Contact Us page, I'm always happy to hear from my visitors.